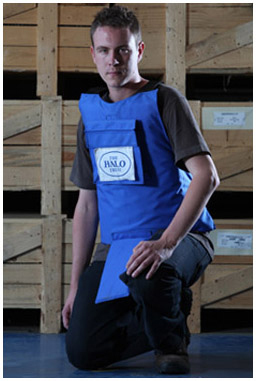 For many years Armourshield has been a main supplier to the HALO Trust, one of the United Kingdom's major mine clearance agencies supplying them with a simple but effective de-mining apron for clearance schemes throughout the world. The apron, the IPA/25 has seen minor modification over the years but it remains a tried and tested product with numerous "saves" to its credit. With the input of those in the "front line" the humanitarian aid theme has been expanded to include the BDG/25 apron with additional coverage to protect against "Claymore" mines and the WAD/25 for those involved in munitions clearance / disposal. 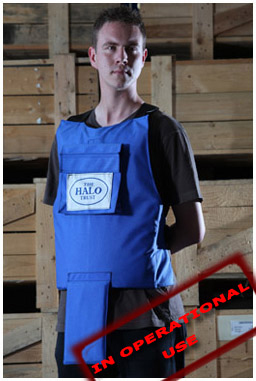 Variations on the IPA apron are available for industrial use where flying fragments and swarf are a potential danger subject to regulatory requirements. "Header photos are used with the permission of the Halo Trust"